Pickle is such a important part of the staple at my house and we can never have enough of it. 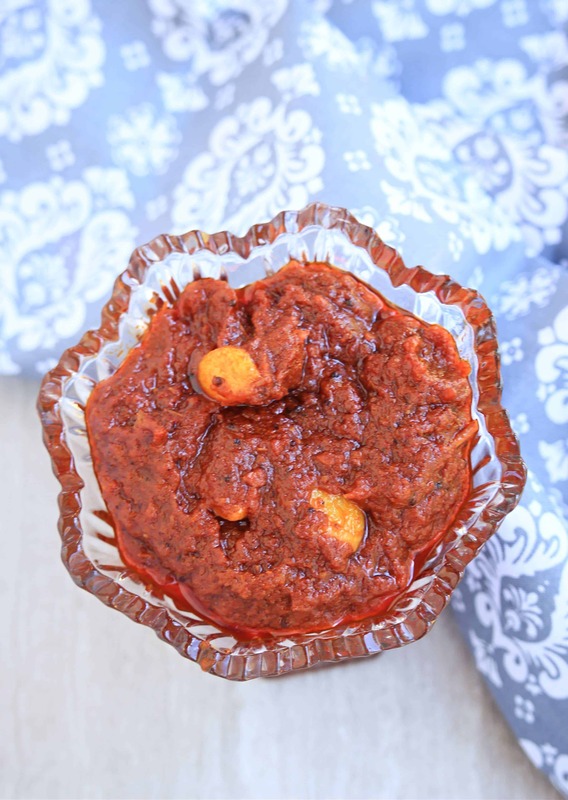 Tomato pickle or Tomato Thokku is one such seasonal pickle that I make in summer months when there is an abundance of fresh tomatoes from our backyard. This Instant Andhra Style Tomato Pickle is another variation of Tomato pickle with garlic in it and made using a slightly different method. I am surrounded by lot of friends from Andhra and absolutely love their food. 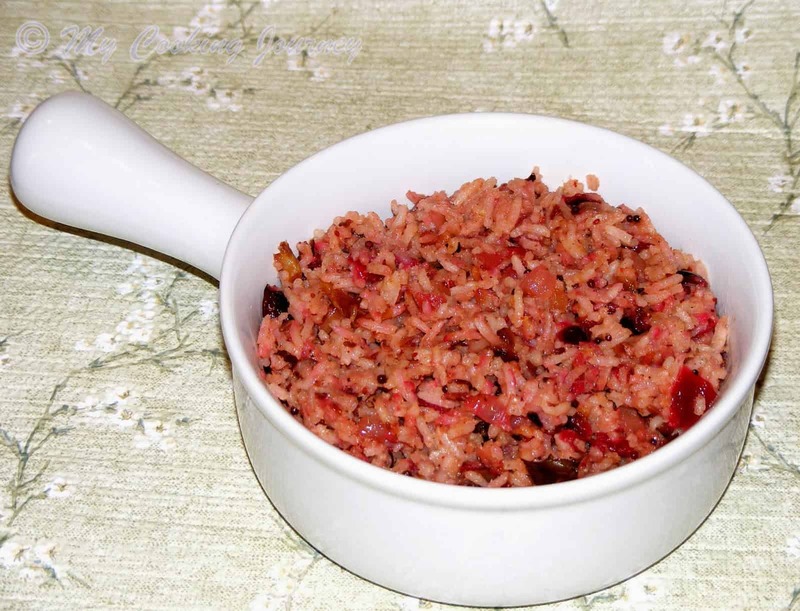 It is spicy and so full of flavor that it makes me want to eat more and more. There have been many times that the spice level is above and beyond what I am used to eating and yet I could not stop eating the food as it was so tasty. My friends here who have witnessed me in these situations would be laughing readi g this post. 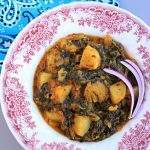 I am a part of a Facebook group called the Food Blogger Recipe Swap, where we are paired with other food bloggers and get to recreate their recipe. This helps us learn new recipes from bloggers in the different part of the world and also help make some friends. This group has been taken over and run by my dear friend and fellow blogger Mireille. 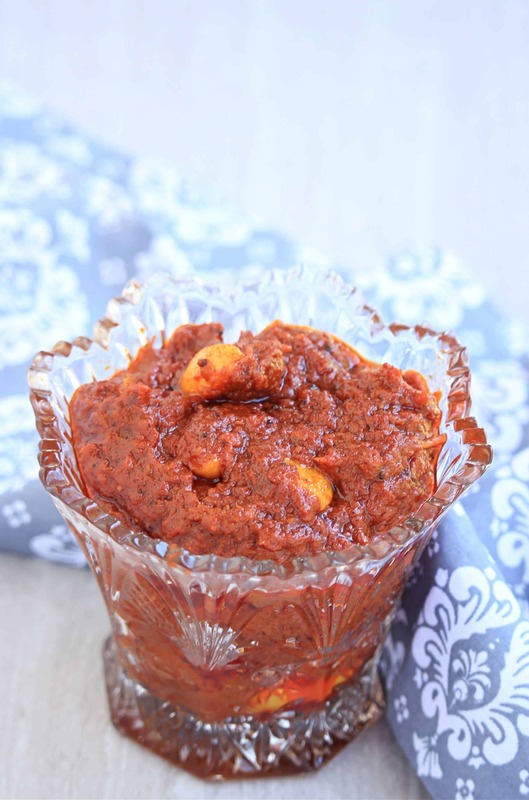 This month I am cooking from Pavani’s Blog and chose to make this spicy Tomato Pickle. 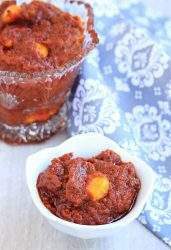 When making tomato pickle one has to remember that it spoils much quicker than any other pickle because of the high water content. 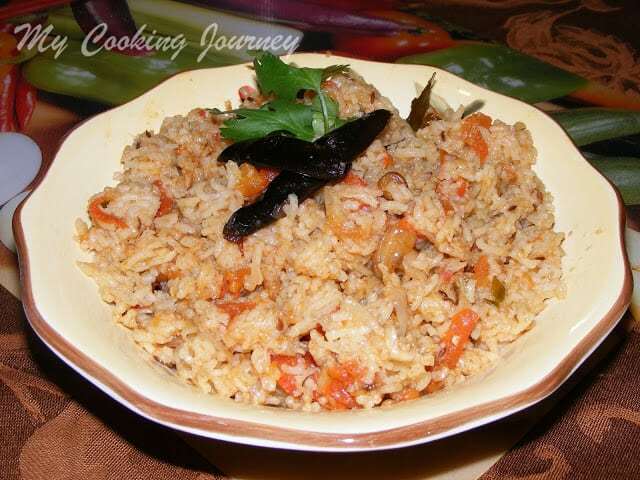 We have to ensure that we cook the tomatoes well until all the liquid has evaporated from it. Also using a dry spoon every time we use the pickle is a important habit to follow with any pickle to make them last longer. If you know me and follow my posts, our love for garlic will be no surprise. Coming from a family where we don’t use much garlic in our cooking, I have never tasted much of pickles with garlic. Lately I have been buying some store bought pickles with garlic but the flavor is not that pronounced. 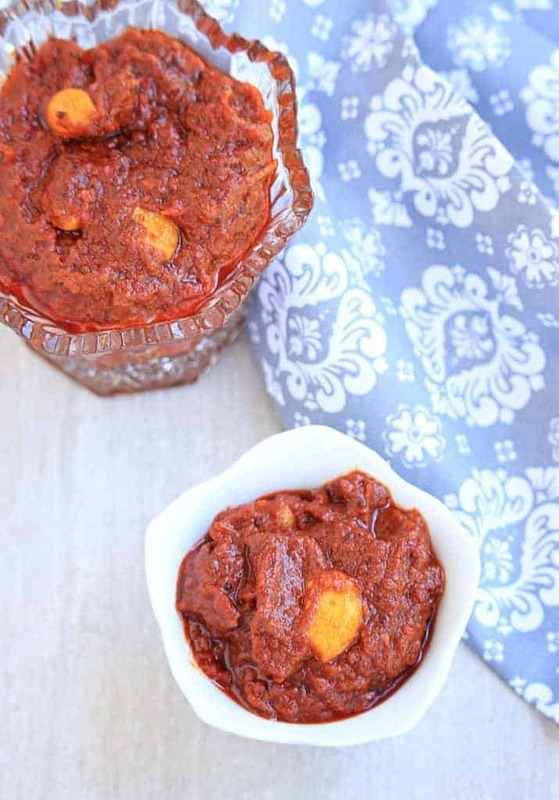 When I saw this recipe for Instant Andhra Style Tomato Pickle with Garlic, I bookmarked this right away to try. Chop the tomatoes and keep it ready. In a heavy bottom pan, heat 3 TBSP of oil and add the chopped tomatoes along with turmeric powder. Mix well and let it cook covered until the tomatoes are mushy. By now you will notice that most of the moisture has dried out as well. Depending on the kind of tomatoes, it might take less or more time for the tomatoes to dry up. 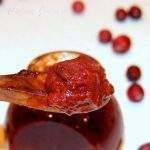 During the last 10 minutes of the cooking time, add the tamarind piece to allow it soften. Turn off the flame and let the mixture cool to room temperature. 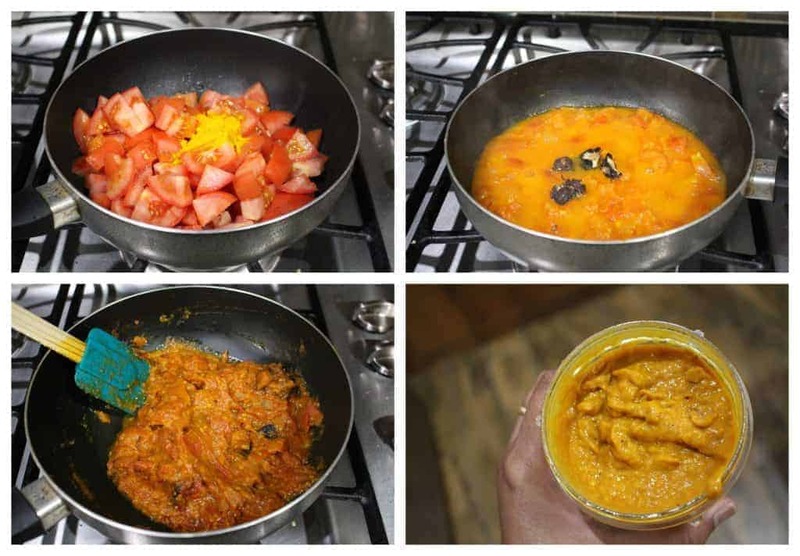 Once the tomato mixture cools down, grind it into a paste. Make it as smooth as you like or you could leave it a little bit of the coarse side. I ground it pretty smooth. 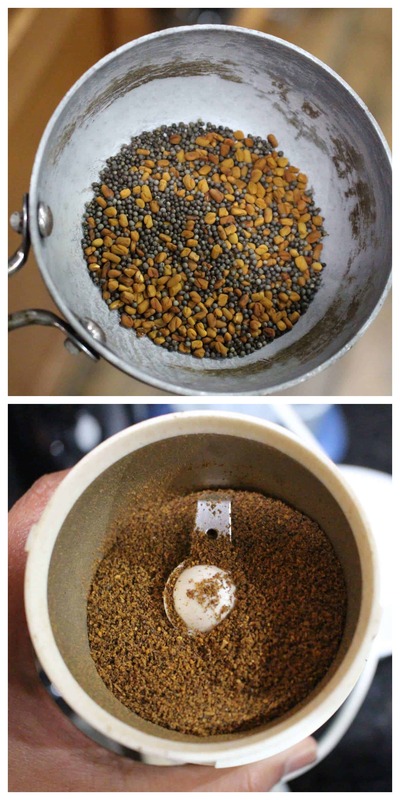 In the meantime, roast 1/2 TBSP of mustard seeds and 1/2 TBSP of fenugreek seeds until golden brown and aromatic. Let it cool down and then grind it to a smooth powder. In the same pan, heat 1/4 cup of oil and add 1 tsp of mustard seed. Once the seeds crackle, add the peeled garlic pods and fry it for 30 seconds or until slightly softened. Now add the chili powder and asafetida to the hot oil and give it a quick stir. Add the ground tomato paste and mix well. Now add the salt needed and mix well until the oil oozes out (about 5 to 7 minutes). Add the fenugreek and mustard powder mixture and mix well. Turn off the flame and let the pickle cool down before transferring to a container. Store it in the refrigerator for longer shelf life. Depending on the kind of tomato, it might take less or more time than 20 minutes for the tomatoes to become dehydrated. I used Kashmiri Chili powder, which is not very spicy. Adjust the amount of chili powder depending on the kind you use. Make sure that the pickle does not have any moisture or comes in contact with any moisture to extend its shelf life. Use clean and dry spoon every time you use the pickle. 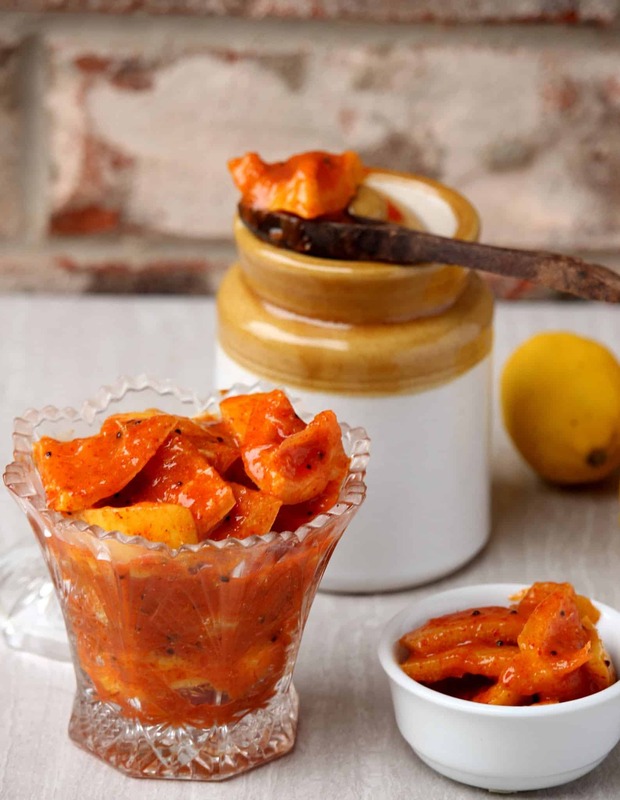 Spicy and flavorful pickle made with fresh and Juicy tomatoes. Perfect as a side with any recipe. Chop the tomatoes and keep it ready. In a heavy bottom pan, heat 3 TBSP of oil and add the chopped tomatoes along with turmeric powder. Mix well and let it cook covered until the tomatoes are mushy. 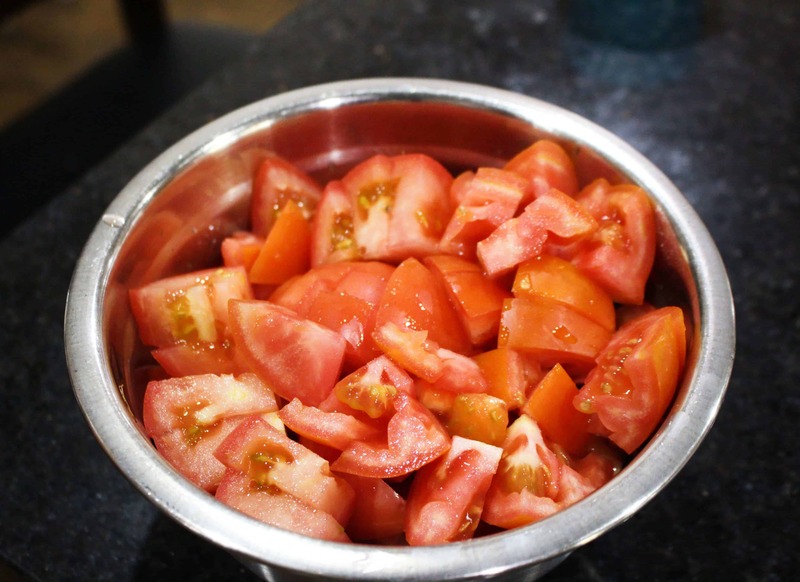 Depending on the kind of tomato, it might take less or more time than 20 minutes for the tomatoes to become dehydrated. I used Kashmiri Chili powder, which is not very spicy. 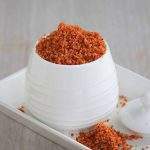 Adjust the amount of chili powder depending on the kind you use. Make sure that the pickle does not have any moisture or comes in contact with any moisture to extend its shelf life. Yum! 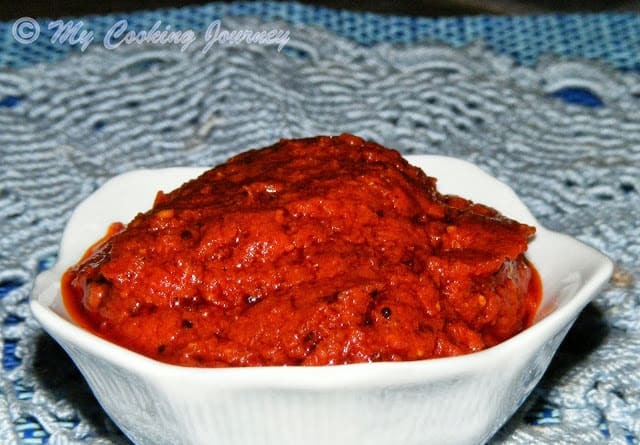 The Tomato Pickle looks fiery and delicious, so very inviting. 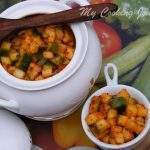 🙂 I remember one of our Telugu family friends used to make this for us – this brings back such fond memories. The tomato pickle looks amazing with that deep ready color and with some garlic as bonus… total winner! 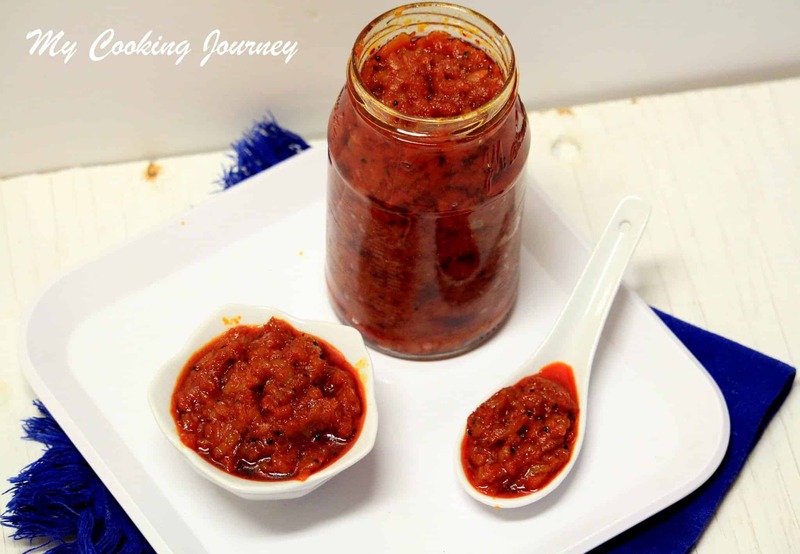 I have always made tomato chutney but not a pickle, loaded with garlic, hot and fiery, love to devour with my Gujju Bhakhri. 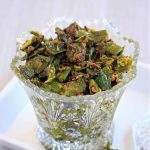 This pickle spicy and tangy – perfect to add to any meal to bring it up a notch to the next level. I have never had tomato pickle before . This sounds so delicious and I am sure the spices would have given it super flavour.